As games get bigger and more ambitious than ever, the amount of resources needed to deliver on the expectations of our players presents interesting operational challenges. To rise to these challenges, EA embarked on a journey in 2016 to establish a world-class central engineering team on Ireland’s West coast, in the charming bohemian city center of Galway. 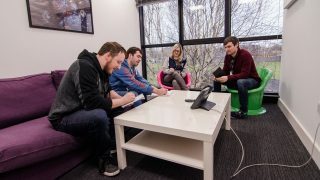 EA Galway’s Central Development Services (CDS) consists of talented software engineers from a variety of backgrounds who work with franchises across EA like FIFA, Battlefield, and more. The team’s unique mission is to develop tools and solutions to increase the effectiveness of EA’s quality verification resources, ultimately raising the quality of all EA titles. The team focuses on the technology that supports quality verification - meaning that EA Galway builds and maintains the technology and tools that help assure every game meets a certain quality bar. In the past, game testing was all done by hand, meaning painstaking hours of manually finding bugs. Today, the focus is on preemptively finding bugs through innovative methods, such as data collection and machine learning. To meet today’s focus, EA Galway builds cutting edge technology, applied to the automation of testing and data collection, enabling EA’s game development teams to maintain efficient and effective quality assurance practices. 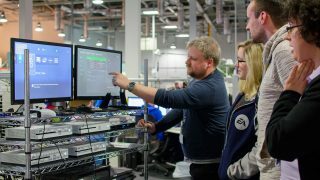 As a key player in development, EA Galway is in constant interaction with teams throughout production as a major production partner. What does this work mean for our players? Ever had a time where you were just a few points away from winning a round in a multiplayer game, but the connection suddenly dropped? Bugs and issues are an unfortunate reality with the scale and scope of modern games, but EA Galway works on developing the tools that make those moments as rare as possible. 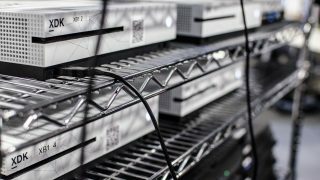 The automated testing of multiplayer games like Battlefield 1 and Star Wars Battlefront II are powered by server rooms filled with hundreds of consoles. Everyday the team is challenged to optimize tools that manage these resources for automation to improve game quality, and preemptively prepare for and prevent problems like the ones described above. EA Galway enables the teams behind games like FIFA and Star Wars Battlefront to improve their automation systems, capture quality data, and troubleshoot issues before they get to our players, ensuring that nothing gets between the player and the game. EA Galway is proud to be recognized as a center of excellence for engineering and data platforms. The studio is home to graduates from colleges in Ireland and veterans from different Irish industries across a variety of sectors. EA Galway is connected to EA’s production teams across the world, from Vancouver, Orlando, Montreal, Romania and Stockholm, forming a wide network of engineers exchanging ideas and experience on cutting edge games and technologies. The team in Ireland is honored to have received many global recognitions, from company stocks, promotions, to center stage at conferences across the world. Members of the studio have received two patents for their innovative work and have also been invited as keynote speakers at a programming festival in Ireland called Games Fleadh. The best part? EA Galway has a bright future ahead, contributing to the tools behind games like BioWare’s new IP, Anthem, the next Battlefield title, EA’s upcoming Star Wars games, and so much more. It’s an exciting time for this young studio! Interested in joining the team? Check out EA Galway’s open positions here.